In partnership with Hinesburg Land Trust and Vermont Land Trust, The Trust for Public Land protected 590 acres of prime farmland, endangered species habitat, and riparian wetland in Chittenden County, Vermont. The property, known as Bissonette Farm, contains the headwaters of the LaPlatte River, which feeds into Lake Champlain and serves as a drinking water supply for approximately 68,000 people. Formerly channeled for agriculture, the river’s natural meander and riparian wetlands will be restored with help from the State of Vermont’s Clean & Clear Action Plan, a program that aims to improve water quality in Lake Champlain. 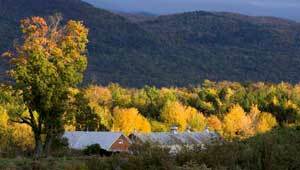 Approximately 150 acres of the farm’s most valuable land was protected in perpetuity through easements held by Vermont Land Trust. Approximately 300 acres were transferred to the Town of Hinesburg for public recreation, habitat protection, and forest management purposes. Funding for the project was provided by the State of Vermont, The Town of Hinesburg, USFWS, conservation buyers, and many private individuals & foundations.